Research shows that roughly 75 percent of all attention-deficit hyperactivity disorder (ADHD) cases are genetic-based. According to research conducted into ADHD and genetics by the National Institute of Mental Health (NIMH) involving twin and adoption studies show a distinct familial connection between those people that develop the disorder and those that do not. Children with siblings that have been diagnosed with ADHD are anywhere from 300 to 500 percent more likely to develop the disease. These studies identify key gene combinations within human DNA that impact the dopamine transporters in the brain. Although there has been no exact gene identified as the single culprit, scientists isolate a connection between ADHD and a seven-repeat allele of the dopamine receptor DRD4 gene. This is a chemical messenger which communicates between nerve cells in the brain. According to scientists, this is an essential part in both movement and general mental health, which may help point to the reason the symptoms develop. In a National Institutes of Health study of 105 ADHD children and 103 without, magnetic resonance imaging scans revealed the presence of the gene in most of the afflicted subjects. Still, the studies also reveal a strong influence from environmental patterns as well. Using the studies into the genetic causes of ADHD, scientists hope to make advancements into the treatment of the disease. At the present time, ADHD is treated using a combination of drugs that act as stimulants. Stimulants affect the dopamine transport system, relieving the symptoms of the disorder. However, these can also have detrimental side effects on the person using the medication including irritability, raised blood pressure, depression, anxiety or even psychosis. Identifying the exact genetics of the disease will help scientists find different options for treatment. One of the most prevalent identifiable factor in patients with ADHD is the occurrence of thin brain tissue during childhood. 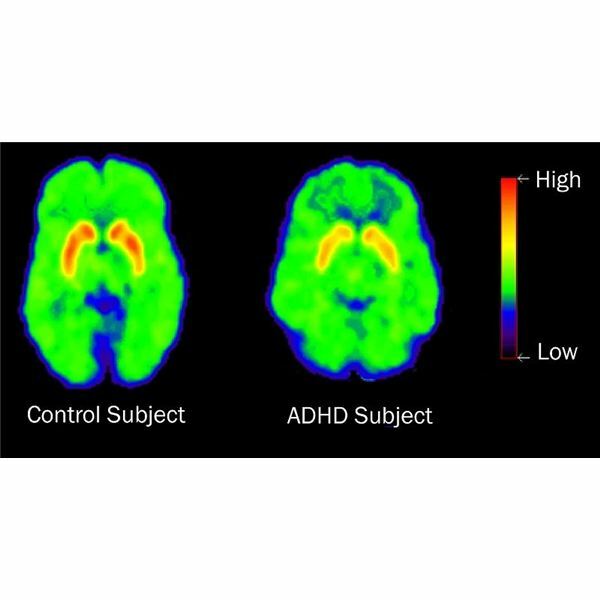 According to the NIMH, scientists are investigating the connection between a gene which causes this brain tissue feature and ADHD. While the brain tissue is an apparent sign of the disease during childhood, as adulthood is reached, the patient regrows the tissue to regular levels and the symptoms of ADHD subside. By identifying the exact gene responsible for the brain tissue malformation may lead to more efficient diagnosis of the disease. By the numbers, the importance of research into the connection between ADHD and genetics is obvious. Roughly 6.7 percent of all school-age children suffer from the disorder according to NIMH, the vast majority of them male. Familial connections range anywhere from 17 to 41 percent, meaning that when one child has the disorder, there is good chance the other one will as well. Fathers suffering from the disease pass it on 15 to 44 percent of the time, while mothers range from four to 38 percent. Monozygotic twins, twins from a single egg and sperm, are nearly 100 percent likely to develop the disease together, while dizygotic twins, those from two zygotes, are estimated at 64 percent. Preliminary testing into adopted-away siblings have revealed similar figures, helping promote the likelihood that ADHD and genetics are definitely linked.